Making a spore print of the mushroom Volvariella volvacea shown in composite: (photo lower half) mushroom cap laid on white and dark paper; (photo upper half) cap removed after 24 hours showing pinkish-tan spore print. A 3.5-centimeter glass slide placed in middle allows for examination of spore characteristics under a microscope. The spore print is the powdery deposit obtained by allowing spores of a fungal fruit body to fall onto a surface underneath. It is an important diagnostic character in most handbooks for identifying mushrooms. It shows the color of the mushroom spores if viewed en masse. A spore print is made by placing the spore-producing surface flat on a sheet of dark and white paper or on a sheet of clear, stiff plastic, which facilitates moving the spore print to a darker or lighter surface for improved contrast; for example, it is easier to determine whether the spore print is pure white or, rather, very slightly pigmented. The mushroom is left for several hours, often overnight, in this manner. Some guides advise using a moisture-resistant enclosure, like a glass or jar, to contain the mushroom during printing. If the mushroom is to be preserved, a small hole can be made in the spore print paper rather than cutting the stipe. When the mushroom is removed, the color of the spores should be visible. Mycologists often use glass slides, which allow for quick examination of spores under a microscope. A mushroom cannot be identified from its spore print alone; the spore print is only one characteristic used in making a taxonomic determination. Spore prints are usually white to cream, black, or shaded of red, purple, or brown. The poisonous false parasol (Chlorophyllum molybdites) has a green spore deposit. Although the spore print is generally used to help identify the genus of a specimen, on occasion it can be used to help distinguish between similar species. For example, the lookalikes Russula crustosa and Russula virescens have yellowish and white spore deposits, respectively. In the field, spore print color can sometimes be quickly determined by examining the top of stipes for spore "dust" on the nearby forest floor. The spore print is not always successful, as some mushrooms are too young or old to produce spores. Mushrooms collected at high elevations will typically not produce a spore print at lower elevations. Sometimes, the color can vary depending on the thickness of the spore print. In the genus Lactarius, thin deposits are usually white, while thick deposits are cream to yellow. Many of the original authors of species in this genus did not indicate whether spore print colors they recorded were with thick or thin prints, limiting the usefulness of this feature as an identification characteristic. 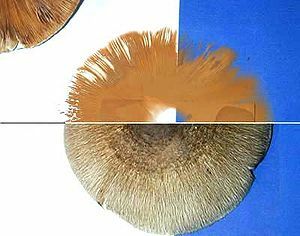 In some instances, the color of the spore print matches that of the mature gills, but this is not always true and gill color cannot reliably be used as an indicator of spore print color. Historically the classification of many families of fungi were based on spore color, a feature first systematically emphasized by Swedish mycologist Elias Fries. An example is the Tricholomataceae, a large family containing many fungi whose common factor was having white spores. However recent molecular research has shown some interesting relationships, with some fungi of disparate spore colors showing close relations. ^ Evenson VS. (1997). Mushrooms of Colorado and the Southern Rocky Mountains. Big Earth Publishing. p. 19. ISBN 1-56579-192-4. ^ a b Halling RE, Mueller GM (2005). Common Mushrooms of the Talamanca Mountains, Costa Rica. New York, New York: New York Botanical Garden Press. pp. 14–15. ISBN 978-0-89327-460-3. ^ Laessoe T. (2002). Mushrooms. Smithsonian Handbooks (2nd ed.). London: Dorling Kindersley Adult. p. 17. ISBN 978-0-7894-8986-9. ^ a b Kuo M. (2007). 100 Edible Mushrooms. Ann Arbor, Michigan: The University of Michigan Press. p. 31. ISBN 0-472-03126-0. ^ Weber NS, Smith AH (1980). The Mushroom Hunter's Field Guide. Ann Arbor, Michigan: University of Michigan Press. pp. 8–9. ISBN 0-472-85610-3. ^ Bessette AR, Bessette A, Harris DM (2009). Milk Mushrooms of North America: A Field Guide to the Genus Lactarius. Syracuse, New York: Syracuse University Press. p. 2. ISBN 0-8156-3229-0. ^ Singer R. (1986). The Agaricales in Modern Taxonomy (4th ed.). Koenigstein Königstein im Taunus, Germany: Koeltz Scientific Books. pp. 1–4. ISBN 3-87429-254-1.